"Be the most preferred and trusted financial institution serving the military and their families." You can leave the military, change employers, move, retire, get married—and never have to leave Navy Federal. "Once a member, always a member." With over 8 million members and over $95 billion in assets, Navy Federal is in good financial shape, even as we expand our branch and ATM network to serve our growing membership. We invest your savings primarily in loans to fellow members. The remainder goes in U.S. securities and federally insured banks. Navy Federal looks for service-oriented team players with strong interpersonal skills, the right attitude and adaptability to a changing, dynamic environment. In general, we hold to the adage, "hire for attitude and train for skill." 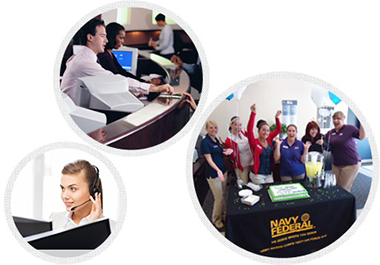 At Navy Federal our culture is rooted in our Guiding Principles of Service, Commitment and Integrity. We believe that it is an honor and privilege to serve our members and provide them outstanding products and services. That is why we offer our employees a career, not just a job. Our employee total rewards package includes competitive salaries, incentive programs, comprehensive benefits, retirement plans with employer match, award-winning training programs, professional development programs, tuition assistance and paid leave. We have large campuses in Vienna and Winchester, Virginia; Pensacola, Florida; and San Diego, California, with over 290 branches around the world. We offer a career, not just a job. We're proud of the robust benefits package we offer to both full- and part-time employees. Comprehensive medical coverage, catastrophic coverage and prescription drug benefits. Choice between a PPO and HMO, depending on location. 100% paid. Provides benefits of two times annual salary for Life Insurance and two times salary for Accidental Death and Dismemberment. Optional defined contribution retirement plan with company match. You contribute pre-tax dollars and choose the fund(s) in which you wish to invest. Employees at all levels of the organization have the opportunity to attend employer-sponsored workshops. Includes graduate-level instruction and executive skill development for those at the supervisor/manager level and above. Plus our Partners In Performance bonus plan and educational assistance. We have many reward programs that acknowledge our employees for their exceptional leadership, service and commitment to our members and our organization. Every year, we recognize our employees' achievements with these awards.